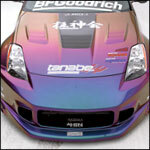 Tanabe is involved in a wide variety of motorsports as part of our endless pursuit of engineering superiority. With a 20 year racing heritage, we have involvement in a variety of motorsports, including Formula N1, JGTC, Super GT, Drag Racing and Drifting. We also fully support motorsports at the grassroots level, which includes autocross and gymkhana. The extreme competitiveness of professional motorsports, where every fraction of a second is important, requires the vehicles involved to be of the highest tuning specification to maintain speed and staying power, in some of the fiercest competitions in the world. Motorsports development allows us to take our motorsports technology, and apply it for everyday automotive useage. This helps us create higher tolerances, extended durabilty, increased safety, and the best performance for each product application we offer. 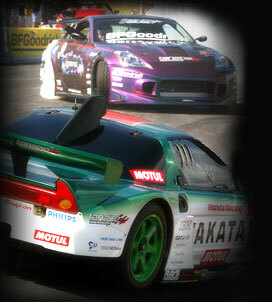 The entire Tanabe product line is a direct result of our efforts on the motorsports stage. Tanabe continues to support the Team Reito MOLA GT-R since its consecutive championship victories in 2011 & 2012 Super GT500 series. This GT-R uses Tanabe's PRO210 springs which gives superb handling and withstands the stress of circuit racing. PRO210 springs are linear and are available in several diameters and varying spring rates for complete customization of Tanabe coilover systems. 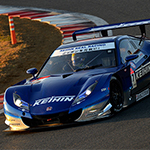 Tanabe's recent involvement in the Japan Super GT series includes the KEIHIN Real Racing HSV-010 in the 2013 GT500. The HSV-010 is the spiritual successor to the iconic Honda NSX (before the new 2014 NSX concept was used) that allowed Honda to maintain its motorsports heritage in Super GT. 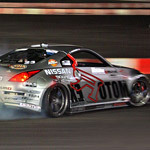 Tanabe PRO210 springs were supplied to aid in the most precise handling and performance for the championship season. PRO210 springs are linear and are available in several diameters and varying spring rates for complete customization of Tanabe coilover systems. The legendary Takata Dome race team has a history for it's competitiveness and ability to consistently win in Japanese Motorsports. 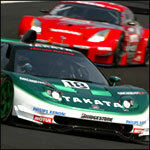 In JGTC, Takata Dome has been campaigning the Honda NSX, in which Takata Dome earned Honda their first ever JGTC Championship in 2000 and continued to dominate the series for several years thereafter. Even when faced with heavy restrictions placed on the NSX class cars by the JGTC sanctioning bodies in recent years, the Takata Dome NSX remains fiercely competitive through the efforts of the race team's staff, drivers, sponsors and product development partners. 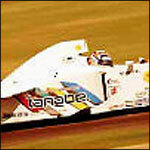 Takata Dome embodies Tanabe's "Racing Spirit" and we are happy to support Takata Dome's efforts throughout 2004. Nagisa Auto, a tuning shop located near the Tanabe headquarters in Osaka, shares a history with Tanabe for product development, and racing heritage. Recently, Nagisa Auto is causing a great stir in the Japanese motorsports community, as they continue to shatter many circuit records throughout Japan using their highly tuned vechicles, which include this CT9A EVO 8 as well as an R34 GTR, S15, and FD3S. Nagisa Auto developed their own line of extremely rugged, adjustable control arms and chassis parts to support their motorsports efforts. Tanabe fully supports Nagisa Auto, and provides their vehicles with full coilover suspensions , chassis parts, and the new Concept G Blue to complement Nagisa Auto's own parts. This EVO 8 was used in the development and testing of our new coilover suspension and exhaust line. The Signal Auto R34 GTR is a car that arguably needs no introduction. Already a legend in Japan, and one of the most talked about, and widely covered cars in the US for several years straight, this R34 Skyline GTR is competitive on a variety of motorsports stages. On the drag strip, the stroked out engine of this vehicle is capable of 1200hp and was able to achieve an astounding quarter mile time of 8.64 seconds using the stock body and untubbed wheel wells. This car is predominantly used for circuit and time attack purposes, in which the hp is tuned down to approximately 700-800hp. 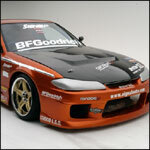 This vehicle has broken a variety of records in Japan, and in 2004, broke Buttonwillow's track record and placed 2nd at a variety of other US time attack functions, amazingly only using off the shelf STREET RADIALS provided by BF Goodrich, while the competitors used soft compound racing tires. Tanabe fully supports Signal Auto and provides the R34 with Sustec PRO Suspension and Tanabe Exhaust and Sustec chassis parts. The Signal Auto EP3 was commissioned for construction and competition by North American Honda in 2003 as part of a tuner and manufacturer contest to build the best EP3 Honda Civic hatchback to compete across a variety of categories (looks, power, time attack, smog) for SEMA 2003. The Signal Auto EP3 is turbocharged and capable of power in excess of 350whp. With the car's extreme power and handling ability, this EP3 would take top points and honors. During the time attack portion of the contest, the EP3 stayed ahead of the pack by over an astounding 15 seconds, with the help of newly developed Sustec Pro S-S suspension , chassis bracing and a prototype center exit Ultra Medalion. Unfortunately, an oil feed line to the turbo dislodged near the end of the race which resulted in a DNF. This vehicle is streetable in its current form, and was actually for sale by Signal Auto. The new Signal Auto 350Z is quickly getting a lot of attention for it's SR20DET engine configuration, and the nimbleness it has exhibited at various drifting exhibitions throughout the US. 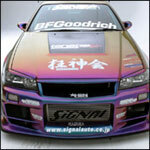 This car will be seen participating at various drift competitions and exhibitions throughout the US and more this year. The Sustec Pro DD, developed for the 240SX was adapted for the Z33 chassis during rigorous US based track testing in 2004. We also used the Ultra Medalion on this Z33. 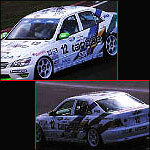 The technology of the DD and coilover line was advanced through testing on this car. Chris Forsberg is a professional drifter currently competing in Formula D and American D1 series. Arguably one of the most talented and competitive young American drivers, Chris' personal car is a Nissan 350Z equipped with an SR20DET engine. This car campaigned around the US for several years as Chris gained fame and respect for his exceptional driving skill in this chassis. We developed the Sustec Pro DD, Sustec chassis parts and Tanabe Super Medalion Racing for the 350Z with the assistance and input of Chris. We support Chris Forsberg and wish him the best this season! JR, along with close friend Chris Forsberg and his Drift Alliance teammates first started making waves in the US drifting scene over a year ago on the east coast. JR's immense talent was quickly realized and acknowledged once he made appearances at other private drift events in other States. 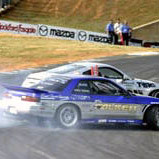 JR's personal car, an early model 240SX coupe was quickly retrofitted and transformed into a sponsored race car, which campaigns and consistently places in Formula D and some American D1 series. We fully support Mr. Gittin and provided him with our Sustec chromemoly stabilizers, Sustec Tower Bar, and with the 80mm Super Medalion Racing catback exhaust. We wish him the best this season! 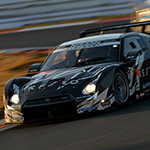 Team Moon Craft is a well regarded racing team that participates in many racing events throughout Japan. In the latter 90's Tanabe fully sponsored Team Moon Craft (Shigekazu Wakisaka) during their campaign in the popular Altezza Cup. In the one-make race format, the competition is extremely close, as the vehicles are all on a virtually level playing field, and any and all small improvements on the parts level would bring the racing teams an extra edge in obtaining victory. Increasing the tolerances and overall quality of parts would result in a more reliable race car. The full line of suspension, chassis and exhaust products were improved and developed from our involvement with Team Moon Craft. Formula Nippon is a well known national racing series in Japan, where a variety of chassis builders, engine manufacturers, and tuners can participate. Attracting professional drivers around the world, Formula Nippon is one of the highest tier motorsports in Japan, alongside JGTC. Tanabe fully supports the Formula Nippon series, and participated in the buildup of a competitive chassis to assist with product development in the 1990's. The incredible tensile strength, reliability, and performance of the Tanabe coil spring was improved in the 210 Series performance springs as a result of our involvement in Formula Nippon.